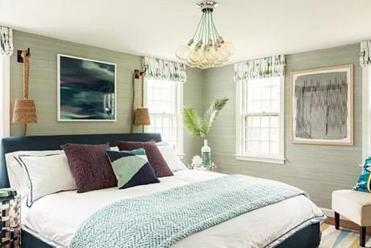 With its indoor-outdoor atmosphere and eco-friendly architecture, this Western Mass. house is green in every sense of the word. When Eva and Fred Fierst bought the property in 2010, the sole structure was a tiny hunting cabin, and thick trees concealed the vistas. 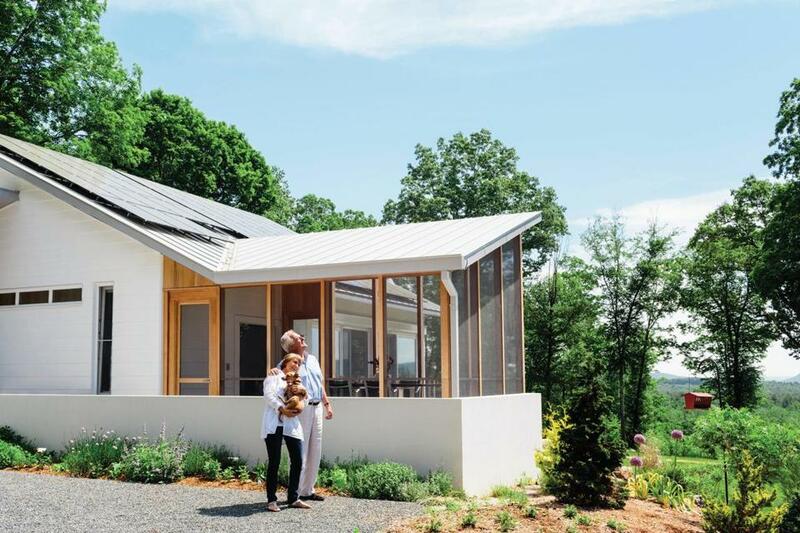 The house has a screened porch and rooftop photovoltaic panels. The summer dining room, a soaring screened porch, is the first feature that appears after cresting the long, wooded driveway and entering the sunny clearing. Architect Mary Yun, who collaborated on the project with then-partner Lynn Rice (Yun now heads her own firm), envisioned the 300-square-foot porch as a kind of treehouse. “Most screen porches are too low and don’t actually allow for much ventilation,” she says. 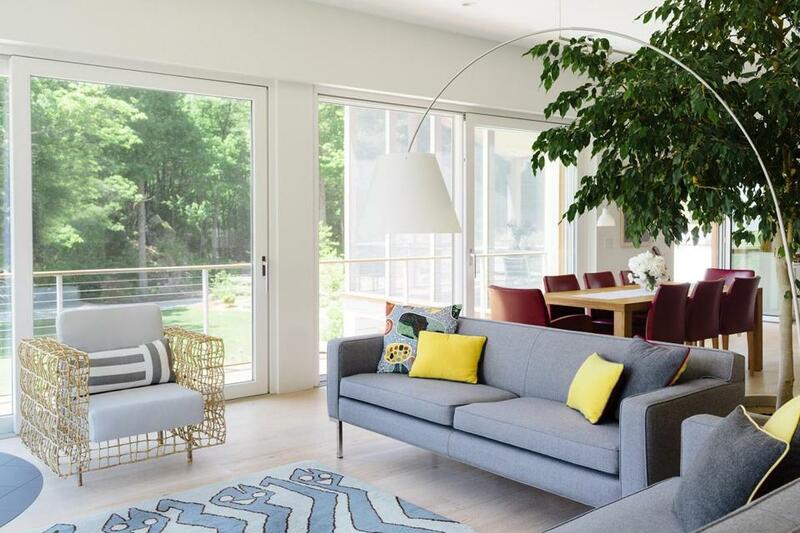 “Instead, the built form of the porch should make you feel like you’re outside.” That’s certainly the case with this airy structure, 13½ feet at its highest point and screened from floor to ceiling on three sides. “Of course, these windows are pieces of art, too,” says Fred, sitting in the generously proportioned multi-tasking space that forms the home’s light-filled heart and gazing at the wooded hills that roll with a gentle rhythm all the way to the distant mountains. In Eva Fierst’s combined living, dining, and kitchen area, triple-glazed windows that flood the space with light can be opened to welcome summer breezes. 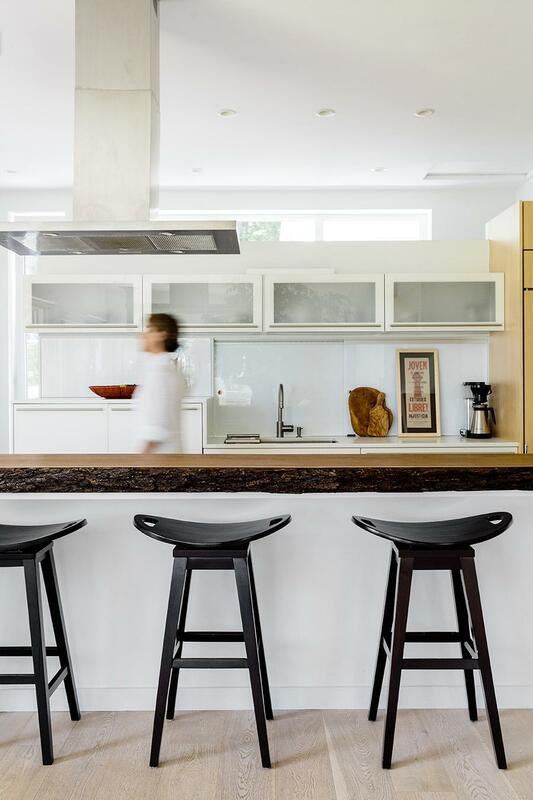 An island topped with a slab of live-edge black walnut and Frampton Saddle bar stools from Wayfair add contrast to the streamlined kitchen area. The freestanding back wall lets light flow while hiding a recycling station and pantry. Architect Mary Yun designed a steel-cable balcony railing that leaves the lush views from the living area unobscured. The distinctive armchair, a recycling-store find, is from Kenneth Cobonpue’s Yin & Yang collection. 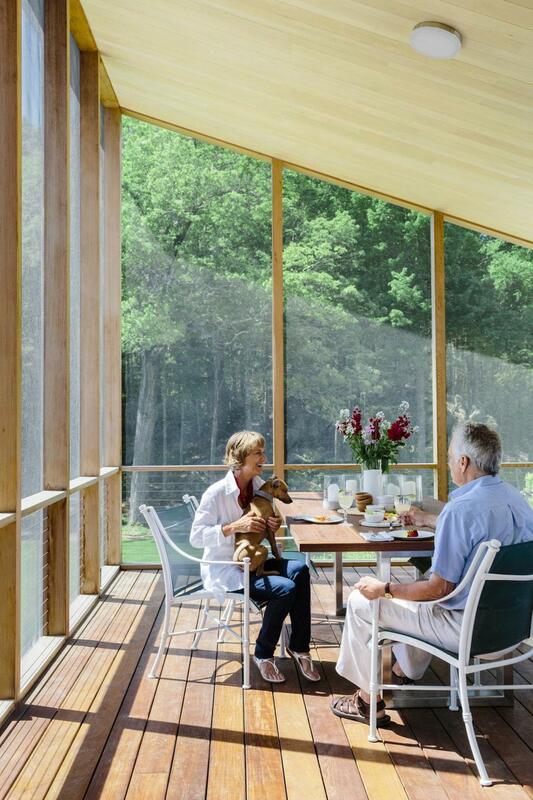 Eva and Fred Fierst relax on their screened dining porch, just a few feet from the kitchen’s food-prep area and built on a deck constructed of ultradurable ipe wood. A sleek custom table accommodates meals with the couple’s grown children and friends. Debra Jo Immergut is a Massachusetts-based design writer. Send comments to magazine@globe.com.